Bridger is a three year old German Drathaar/German Wirehair. Bridger loves the outdoors and goes almost anywhere to retrieve and find birds. Bridger was professionally trained for bird hunting. He is whoa broke. He points on sight, smell, and sound. He is also obedient, and loves kids. 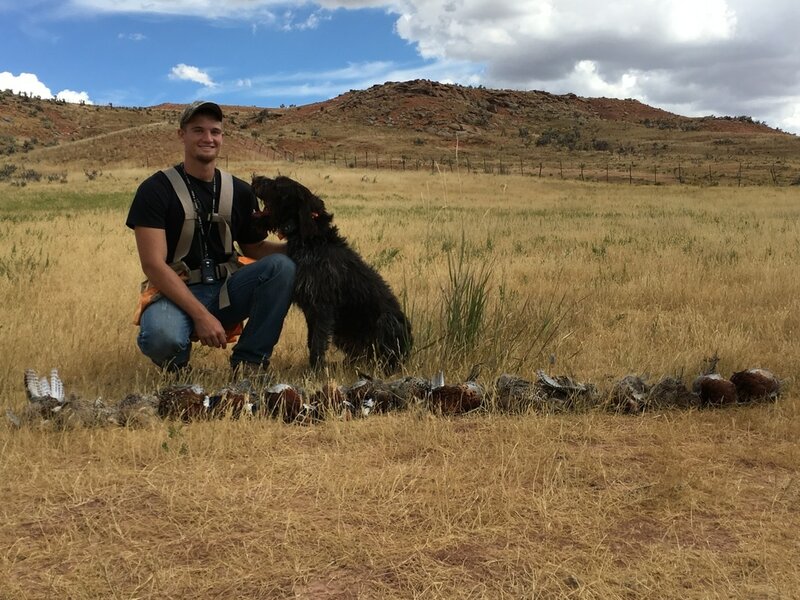 Bridger has hunted pheasants, quail, chucker, grouse, and all waterfowl species. Bridger has been hunting with me for two seasons now, and every progressive season he keeps improving with his pointing and retrieving skills. I also am adding a new edition with a little eight week old purebred German Wirehair female named Etta. Both parents have hunted pheasants, quail, chucker, grouse, ptarmigan, and waterfowl. I plan on having Etta trained and ready to go hunt next season up at castle rock upland sporting. Hi! My name is Trevor Hale, I am 21 years old and I have lived in Coalville, Utah my whole life. I started hunting when I was 5 years old by tagging along with my dad and older brother on their hunts. I learned how to hunt safely and have now incorporated that into being a hunting guide. My first hunt was actually a pheasant hunt, which was the perfect way to start out my passion for hunting. Pheasant hunting is fast action: keeping kids and adults entertained and it provides lots of shooting and chasing birds. There is no one other hunt that gets your heart racing like hearing the thundering wings and cackling roosters flying out of cover into the air. Meet Dixie!! Dixie is a 7 year old white and black English Setter. She has a great nose and sets up nice for hunters to flush. She hunts hared the whole time we are out in the field and retrieves very well. Dixie has a hard post so I can help novice hunters get set up to have a good shot opportunity on the bird. Dixie is a sweetheart, friendly with people and loves her job. 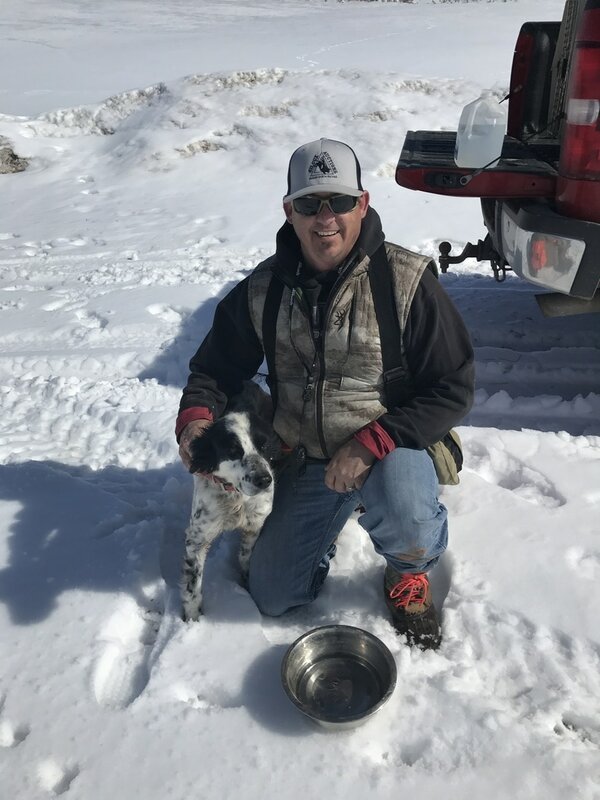 She was trained on birds by Scottie Evans in central Utah. Dixie has been guiding bird hunts for six years. Let her guide you, on your next hunt. My name is Shawn Silcox and I am calling the commands for my girl, Dixie. I love to hunt. I have been hunting since I was two with my Dad and Grandpa. I spend as much time outdoors as I can. My favorite type of hunting is archery. I have been lucky enough to have claimed a big bull, white tail, early season muley, black bear and a mountain lion with my bow. During the day I train horses, specializing in reining horses. Since I was a little boy I have always been around bird dogs and have owned several over the years. I love how hunting and especially bird hunting can bring family and friends together. I appreciate having the opportunity to live in Summit County and spend time hunting with my dad, brother, father - in-law, brother-in-law and son. I live in Henefer, with my wife Katie, our son J.W., and twin daughters Aspen and Fallyn.